"A baked bean in tomato sauce with a spicy twist. Delicious as a snack or a side. An asset to any meal. Serve with toast, pita bread, chapatis, etc." 1Heat oil in a saucepan over medium heat. Cook and stir onion in hot oil for about 2 minutes. Stir chile pepper into onion; continue to cook and stir until the onion softens slightly, 2 to 3 minutes more. Season with coriander, cumin, garam masala, paprika, salt, and pepper; stir. 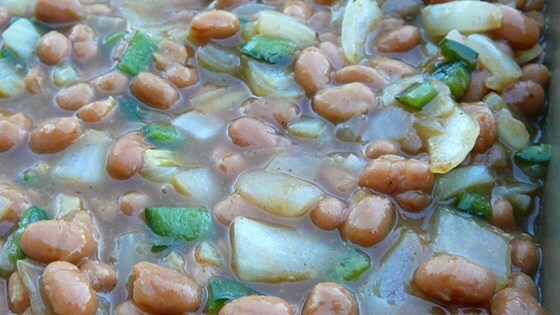 Pour beans into saucepan, mix well, and cook until hot, about 3 minutes.